The Comics of Joe Sacco addresses the range of his award-winning work, from his early comics stories as well as his groundbreaking journalism Palestine (1993) and Safe Area to Gora�de (2000), to Footnotes in Gaza (2009) and his most recent book The Great War (2013), a graphic history of World War I. First in the series, Critical Approaches to Comics Artists, this edited volume explores Sacco�s comics journalism, and features established and emerging scholars from comics studies, cultural studies, geography, literary studies, political science, and communication studies. Sacco�s work has already found a place in some of the foundational scholarship in comics studies, and this book solidifies his role as one of the most important comics artists today. 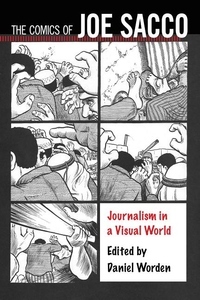 Sections focus on how Sacco�s comics journalism critiques and employs the �standard of objectivity� in mainstream reporting, what aesthetic principles and approaches to lived experience can be found in his comics, how Sacco employs the space of the comics page to map history and war, and the ways that his comics function in the classroom and as human rights activism. The Comics of Joe Sacco offers definitive, exciting approaches to some of the most important�and necessary�comics today, by one of the most acclaimed journalist-artists of our time.